I originally posted this on Christmas Day, 2005. I was reminded of it yesterday by a soundbite from some idiotic socialist liar, accusing those of us who oppose government theft (in the guise of "charity") of being "the kind who would turn Mary and Joseph away." I liked Scott Johnson's Power Line entry last year on Mary and Joseph hardly being homeless, where he refuted the claims of the ever-ignorant Nick Coleman of the Minneapolis Star-Tribune. (Update: it's a fallacy repeated here.) I myself get pretty annoyed by apparent non-Christians (especially self-righteous state-worshippers) who accuse me and other Christians of lacking compassion for the poor just because we advocate limited government. One of my atheist friends used to insist I'm a hypocrite because I stated that government has no role in welfare or other forms of "public charity," that charity must come privately. It stems from a confusion (or worse) that when I say "It's not government's role or duty," it does not mean I oppose private charity. Some consider Christians nuts for their beliefs. Let's consider the leftists who think Medicare can be expanded to everyone, who are surprised that raising taxes doesn't yield the expected revenue, who think taxpayers can provide them with free education, who believe Obama when he says he'll pay down the deficit, who believe that 5% of taxpayers can support the other 95%, who believe the federal government can reduce total debt by spending more borrowed money, who believe the cornswallop that Paul Krugman spews. And yet it's far-fetched to believe in Jesus as the Christ? It's easier for the Savior of the world to rise from the dead and redeem mankind than for any of those liberal fantasies to be true. Taken today around a quarter past 5. Looking back at past trees, this one isn't as large as 2006's, but I think it's the most magnificent since I began photographing them in 2005. Walking past it, it seems so much fuller than its predecessors. 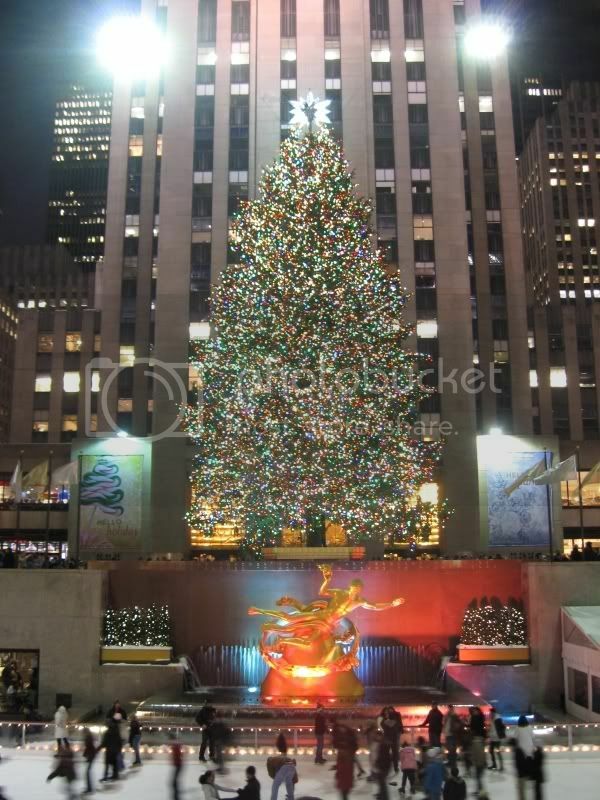 I don't know if this is a good barometer of the local economy, since it might have been from the cold weather, but there definitely weren't as many people at Rockefeller Center this evening. I had no trouble at all getting into the best spot. Even walking down Fifth Avenue afterward, there weren't the usual thick crowds of tourists. "...the Christmas Spirit has swept through Washington like a blizzard!" Harry Reid has been leaving gifts under the trees of wavering senators - a hundred million here, a hundred million there - to pass ObamaCare. Joe Lieberman is the Grinch who stole the public option (thank goodness). Rahm Emanuel is making his (enemies) list and checking it twice. Roland Burris is reciting Christmas poems on the Senate floor. The economy is like Tiny Tim, hobbled and on crutches, but nonetheless resilient and hopeful. Nancy Pelosi is like Scrooge (before the ghosts). And President Obama is like Mr. Potter from It's a Wonderful Life, gobbling up the Bedford Falls economy piece by piece, lashing out at the defiant remnants of its free market. 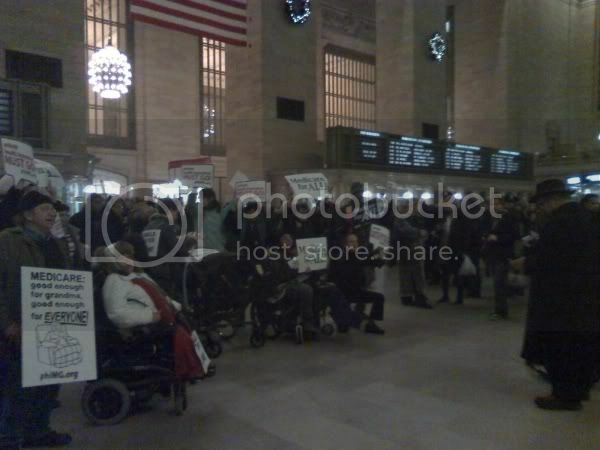 There was a demonstration Friday evening at Grand Central Terminal, and these idiots aren't just looking to expand Medicare to only 55 and up. As yourself the simple question: if Medicare is so good, then why are there so many ads for supplementary insurance that Medicare won't cover? The real idiocy is that the wheelchair-bound people will be the first to be denied coverage once the rationing begins. It'll be just like the UK's NHS: "We regret...Therefore we recommend you get your affairs in order." So much for government-run health care. "Good enough for grandma"? Government-run medicine wouldn't be good enough for my grandmothers, if either were still alive, and it isn't for anyone else who gives a damn about getting good health care. A tax doesn't yield the expected revenue - big surprise! Straphangers could see service cuts next year after all because the state apparently miscalculated how much money the payroll tax would generate for the MTA, officials said Monday. The tax revenue appears to be 20% below what the state forecast for the Metropolitan Transportation Authority -- $200 million less than what the agency based its financial plans on, MTA Chief Financial Officer Garry Dellaverson told authority board members. "This is a shocking development both because of the magnitude of the under-run and the late date of its discovery," Dellaverson wrote. "As recently as last week, the state was continuing to advise us of their comfort with the forecast." The shortfall is on top of a $143 million the state Legislature cut from other transit funds to the MTA last week. This is partially because of the increase in unemployment (falling tax revenues), but also the nature of increasing taxes: politicians promise the world when stealing others' property. The "luxury tax" of 1990 actually lost revenue. (Even PBS admitted it!) Clinton's tax increases in 1993 supposedly produced a 9% increase in federal budget revenues from 1993 to 1994 -- supposedly, because of the important factor that the economy was recovering from recession. Now consider that despite the 1997 tax cuts, revenues still grew 9% from 1997 to 1998. Was the increase because of the tech boom at the time? Of course, and I'm simply being fair to point that out. I'm not pulling a Paul Krugman by claiming that the tax increase created the good economy, let alone was the source of increased revenues. "The state is the great fictitious entity by which everyone seeks to live at the expense of everyone else." Bastiat's words are exemplified here, because the payroll tax affects all wage earners in New York's lowest 12 counties (the five boroughs and Long Island, going up to Orange and Dutchess), whether or not they use the MTA. So people from the Hamptons, all the way to Poughkeepsie and Goshen, must pony up even if they don't ride the subways, buses or commuter railroads. Think about the huge payrolls being stolen from people. The payroll tax is 0.34%, and the MTA reckons the reduced revenues at $200 million. That means they "overestimated" payrolls by $59 billion. Since that $200 million is a fifth of originally calculated revenues, that in turn means the state was planning to shave 0.34% off nearly $300 billion of other people's money. Tony Soprano couldn't do it better. Coincidentally, one of Sunday's "Sopranos" reruns was where two young soldiers had to kick up to Tony, and while Furio and a friend were collecting, Furio demanded another thousand for himself. Whether it's mobsters or the government, it's all based on force.